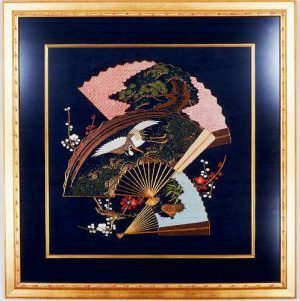 Some of the most rare and unusual Japanese textiles to survive into the 20th Century are examples of works of art created as Wedding Collars. For added adornment, upper class Japanese women would create these one of a kind pieces of art which would then be attached to the leading edge of the Wedding Kimono. The design created on this lovely hand woven, white Silk Wedding Collar was composed freehand through skillful embroidery. 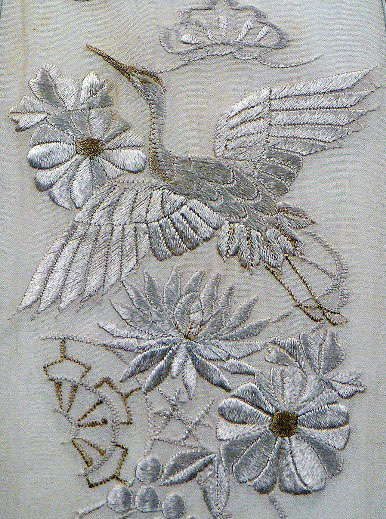 The dominant feature is the graceful flying Crane (“Tsuru”), denoting good fortune, which has been highlighted with light beige Silk Threads. The Collar is divided into two symbolic patterns, above and below the Crane. 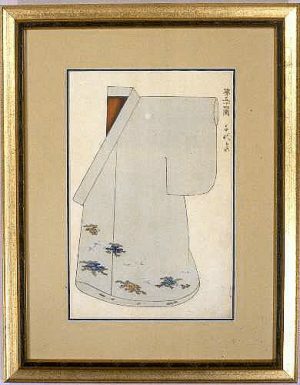 Both elements include scattered Chrysanthemum (“Kiku”), the flower of the Imperial Family. To further emphasize the auspicious symbols intended for marriage are the stylized Pine Trees (“Matsu”) on top, standing for constancy and longevity; and the half wagon wheel on the bottom whose spokes resemble those on the Buddhist Sacred Wheel (“Rimbo”). Not only is it indicative of the nobility, but it also symbolized both the Wheel of the Law and smoothing one’s path. It was also used in ceremonies such as the taking of vows. 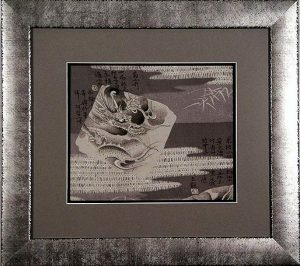 This Bride (“Hanayome”) created a representational design incorporating those elements in life she considered most significant. This is a very unusual Wedding Collar. The design is very subtle with its heavy emphasis on the White on White patterning. This is also a very sophisticated Collar intended to be worn over the White Wedding Kimono, reinforcing the Bride’s innocence and charm. This piece is the only half of the original set to survive. 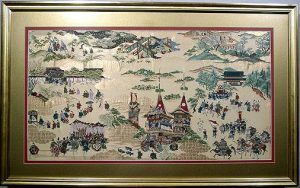 It is very rare to find hand worked Kimono Collars from this period in good condition, as the majority were so badly soiled from the bride’s cosmetics that they have disintegrated over time. 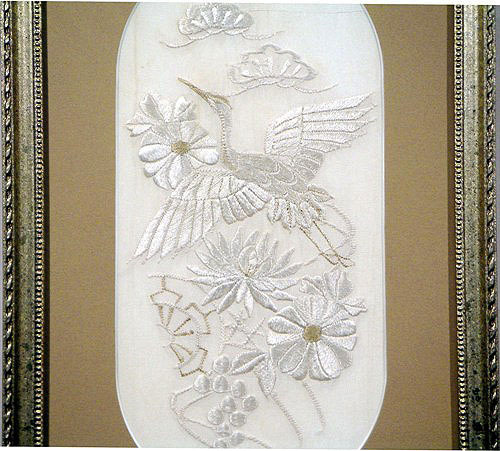 Fine, hand woven White Satin Silk embroidered in free hand style in white and beige Silk Threads. 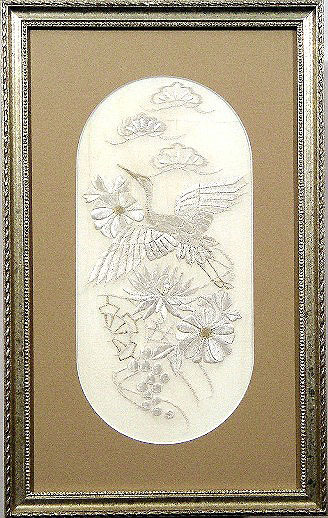 Single acid-free oval cut mat in warm light brown set in a delicately carved muted silver and gold wooden frame. It is protected by non glare, 97% UV glass. This textile has been mounted in conformance with the highest standards in order to ensure a damage free environment.